Upon opening the box, I was speachless. It’s great that they double boxed the package, but as you can probably see there is no protection on the inside of the box. A pile of bottles was just packaged together and left to smack into each other on every bounce and throw of the box. 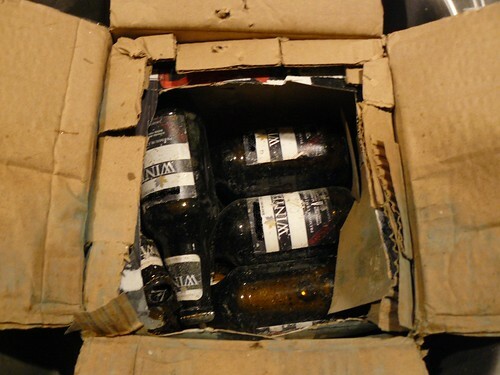 By the time I got ahold of it, half of the bottles were broken, and the box was full of mold/yeast/beer. I didn’t bother to try and salvage anything; it went straight to the trash. My intention is not to call out the offending brewery (I’ve tried to block out the brewery name, and I don’t think many will recognize these by sight; if you do figure it out, please keep it to yourself). I’m hoping some others (breweries and potential traders) can learn from this; you’d be surprised how badly some sample boxes are packed. When beer is shipped through the mail, it must be packaged well. Ideally, one should use styrofoam or cardboard bottle shippers, which you can purchase through packaging supply companies and online at Uline.com. If that is not an option, then use bubble wrap, packaging peanuts, newspaper filler, multiple boxes, and whatever else will cushion the bottles from each other and the external environment. This trading primer at Ratebeer.com has a great section on how to package bottles of beer for shipping. I understand your pain but thankfully I have been the beneficiary of bubble wrap or biodegradable bottle packages. I say you call out the brewery. Good breweries pride themselves on ensuring that when the beer leaves there hands, it’s in the best condition possible and they take on a lot of headaches and expense to ensure each step of the process is properly executed. A brewery that allows beer to leave it’s hands in that poorly of a packaged condition has to, at the least, make you question weather they take pride in their beer. Na – the person I’m in touch with at the brewery didn’t pack it himself and apologized multiple times. He’ll be packing himself next time. Calling them out serves no purpose. I get that, as long as they come correct and make it right. People make mistakes and giving them the chance to make it up is the right thing to do. I just feel that quality issues, both good and bad, are not best served with politcal correctness. Some breweries make the extra effort and some don’t and to not call out the bad with the good, I my opnion, is a disservice to those taking on the time and expense to ensure they get it right. But I agree with your point, people make mistakes and as long as the own it and take the neccessary actions to make it right, then it’s serves no purpose to call them out.